It’s my nephews 2nd birthday this weekend and his mother asked me to make Chocolate Chip Cookies for his party because they will do a Sesame Street party. Clearly the Cookie monster will show up and demand some cookies. 😉 So here I am, making cookies. I made Chocolate Chip Cookies before but I wasn’t too happy with the result, at least not like I imagined them. They were still tasty and nice but improvement is always possible. So off I went to see what the World Wide Web had to offer. Oh my, a lot! 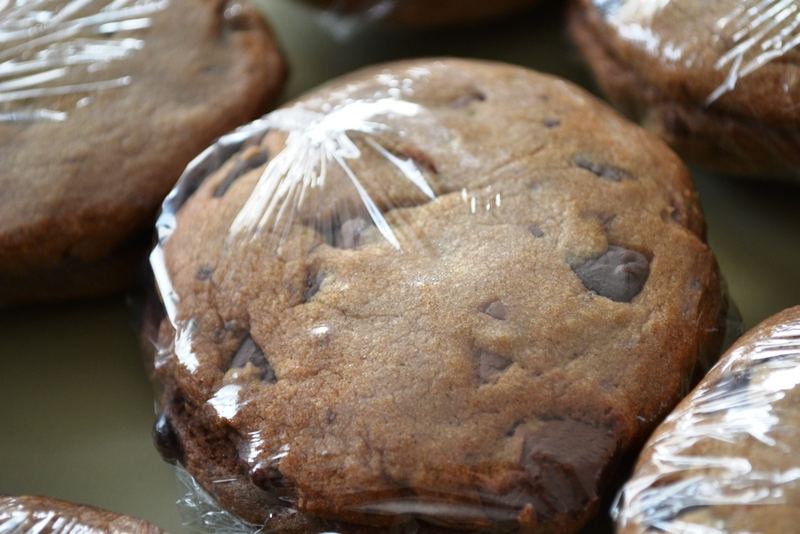 Of course everyone claims to have the best recipe, the chewiest cookies, the most chocolate. I like Bakerella and checked her page, she had one up but that required 24 hours of chilling and that is just not happening for these kind of cookies. Due to the search I found a page that offered a comparison between various recipes. Nice! I think that helped me to decide on one and I went with Alton Brown’s version. First of all, I don’t like it when people do things like “stick of butter” that is not an accurate measurement and you should know that. (Neither are cups but what can you do.) So, I had to convert. Second of all, various sources said that they felt it was too buttery and would omit some of the butter if they do the cookies again. So I did that. Since I doubled the recipe the final butter count was 340 grams. As usual, I omitted some sugar. I feel that 1 1/4 cups are pretty good, plus the sweetness of the chocolate, it should be fine. Although I know that brown sugar is not as sweet as white one. Melt the butter in a sauce pan then set aside. Combine flour, salt, and baking soda in a bowl and set aside. Combine the sugars and butter in a mixing bowl. I used my stand mixer and the paddle attachment with a scraper. Then add the egg and egg yolk, vanilla and milk. Combine well before adding the flour mixture (by the spoon) and mix thoroughly. 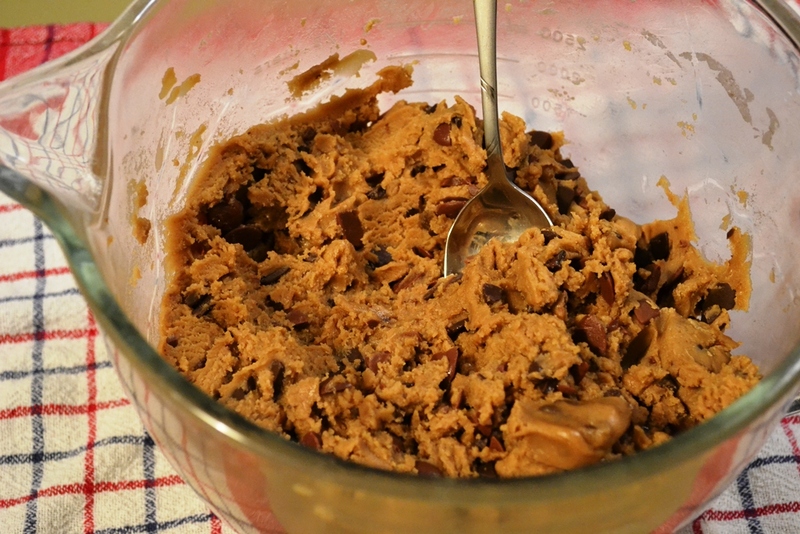 Finally, add the chocolate chips and mix quickly. Then place the dough in the fridge for about an hour. Wrapped up for the party as giveaway. Scoop portions on the cookie sheet, which is lined with baking paper. It depends how big you want your cookies, I used a table spoon but an ice cream scoop will work as well. If you want to be really precise you could use a scale to make sure they all have the same weight. Press them down slightly and bake at 190°C for 10 to 14 min, depending on your oven. I found that they do not spread all to badly so, depending on the size of your cookie tray and cookies, you could fit 6 to 8 on one tray. Double the recipe will yield 46 cookies, well, at least with the size I chose. The consistency, when the cookie is still a bit warm, is slightly chewy but a bit dry. After a day that consistency has not change much. While it’s a good cookie it is still not the one I am looking for. I think that will be a never ending quest. 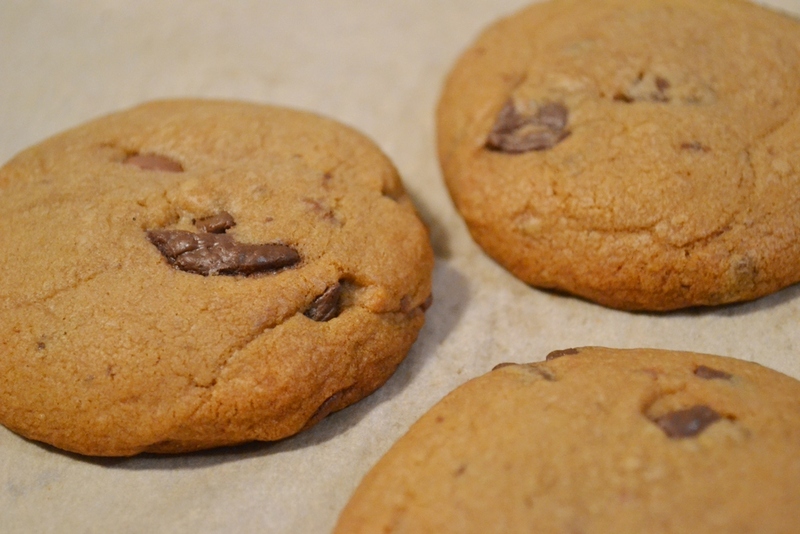 Posted in Cookies and tagged baking, brown sugar, chocolate chip cookie, chocolate chips, cookie, recipe. Bookmark the permalink.